The Haunts of Brisbane: The Royal (James): Harrisville's Haunted Hotel...but why?!? The Royal (James): Harrisville's Haunted Hotel...but why?!? Cast your minds back three weeks to our article on the Pomona Hotel, where I mentioned that I was bogged down in a swamp of hear-say & urban legend whilst attempting to get to the bottom of a tale regarding a haunted hotel? Well...after a lot of detective work, I'm finally in a position to tackle this week's mystery site...although given the photo above, it's no longer a mystery for those of you who are avid "haunted location" fans! Our focus this week is The Royal Hotel in Harrisville, just outside Ipswich - a marvellous old building located at the end of the Warrill View-Peak Crossing Road that runs through the centre of this vibrant country town. Having grown up in Ipswich, I've travelled through this town many times, but little could I have known back then that the seemingly innocent fascade disguised a building renowned for its ghosts! So...what do we know about the site ghost-wise?!? According to the majority of Australian paranormal sites on the internet, the story of the Royal (James) Hotel at Harrisville goes roughly like this (an amalgamation of all published accounts): The hotel was built about 1875...it burnt down in 1920 with the loss of 5-7 lives...figures are seen throughout the building, when no actual staff member is present...objects fall down when no one is in the vicinity...and, above all other claims, a woman in a black dress is regularly spotted in the back rooms, near the kitchen area...one photo remains of the old hotel, with five people sitting outside in front of the establishment, & all witnesses' descriptions of the "lady in black" match perfectly with one of the ladies in the photo. However, it's not just the paranormal websites that list off this information (or remarkably similar versions of it) - there are a number of other websites that follow suite. 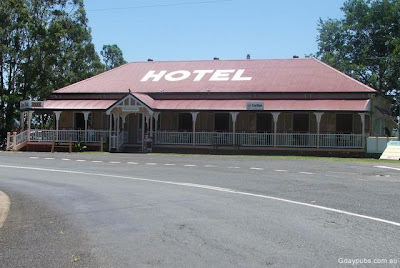 Of note, The Scenic Rim Regional Council tourism website provides a write-up on the Royal Hotel, stating, "Harrisville's first Royal Hotel was built 134 years ago, but this original building burned down in the late 1800s. A local house was shipped in to replace it and was opened as a hotel. But half of that building later burned down and had to be rebuilt and still stands today...[T]he pub is home to seven ghosts, which legend has it were killed in one of the pub’s fires." From an historic perspective, we know that the original hotel built on the site opened its doors in 1875 - the one fact the paranormal websites have correct - although, at the time, the establishment was known as the Harrisville Inn. Local folklore has it that the establishment was renamed the Royal James Hotel three years later in 1878, under new license to Margaret Wholey. However, here we find a glitch in the historic record at this point...when Margaret passed away in 1915, her obituary stated that her husband Denis had predeceased her, however during his lifetime, "they conducted the Royal James Hotel at Harrisville." We know for a fact that Denis Wholey passed away on the 12th of March 1873, two years before the Harrisville Inn opened its doors...as such, he could not have aided his wife in this business endeavour, & it's likely that she was a strong & determined woman hell-bent on making her way in the world - a true entrepreneur. Furthermore, we know that Margaret remarried on the 21st of February 1879, not long after she had apparently changed the name of the establishment to the Royal James Hotel. After her marriage to Edward Dunn, the couple continued to manage the hotel for some years. We also know that from its earliest days, the Royal James Hotel had the appearance of a house. On the 11th of March 1881, the publican Robert Lyttle was brought before the Ipswich Police Court, after having sold two glasses of brandy to two plain-clothed employees of the United Licensed Victuallers Association without holding a license for "spirituous liquors." During the trial, it was recorded that the United Licensed Victuallers Association employees travelled, "to a house occupied by the defendant [Robert Lyttle], having the appearance of a hotel; there was a sign along the end of the verandah, with the words "Royal James Hotel" painted on it." The local Police Constable by the name of Gerarghty also gave evidence, stating that, "he knew a house at Harrisville by the name of the Royal James Hotel." All in all, during the police raid on the premises, bottles of brandy, gin, schnapps, wine & stout were seized, along with a quarter-cask of rum - all liquor for which the house-come-hotel failed to hold a serving license. As a result of the proceedings, Lyttle had his lesser liquor license revoked...a loss that required some fancy footwork over the following year to gain back. Harrisville's main street in 1940, with the Royal Hotel visible centre background. However, let's get back to the haunted nature of the now Royal Hotel, via a story that raised the attention of the print media on the 4th of May 2007. In a Queensland Times article entitled, "Pub Reno Makes Ghosts Happy", the then part owner & Publican Chris Kallis was interviewed regarding the ghosts that resided within the building he had purchased in late 2005. Having spent a considerable sum on renovations during which 75 stumps were replaced, the main bar's floorboards were completely re-laid, interior walls were knocked out to open the venue, the front verandah was extended & the centre portico was rebuilt, it might be argued that the owners were hoping to drum up a little business through the article. However, that aside, the article gives us a clear insight into the haunted nature of the hotel none-the-less - according to Chris Kallis, "At first I thought it was a load of garbage - I was a sceptic. Nothing happened for about eight months. Then things started to move, shake, doors would open, footsteps up and down the hallway. I would be lying in my bed and I would hear people playing pool." Chris Kallis admitted that he had no idea as to the identity of the resident spirit(s)...however he was quite certain that something paranormal was occurring within his country hotel. Unfortunately, due to illness, Harrisville's Royal Hotel was placed back on the market minus a liquor license at the end of 2010...& would languish as a vacant building until being saved by the Patricks & reopened in all of its glory in January 2012. Since taking ownership of this amazing building, Monika & Steve Patrick have aided in breathing life back into the Royal Hotel, & have discovered a new-found comfort within its walls whilst opening its doors back to the surrounding community...however, what of the resident ghosts? Under new management, on the back of the hotel lying vacant for nearly 2 years, have the resident spirits remained or have they parted ways? Apparently, the ghosts still pay a visit...chairs appear to have moved in the dining room inexplicably & doors that have been shut & locked at night are found to be open & flapping the next day...however, an event took place about a month ago that shows beyond reason of doubt that the resident spirits of the Royal Hotel are still active. A woman enjoying a meal at the Hotel looked up from her table to spy a male apparition looking back at her from a nearby doorway...the description she gave of the spectral man was quite specific, being quite short & dumpy with broad shoulders. So sure was she that she'd witnessed something supernatural, that she returned to the Hotel again with other members of her family...in order to show them where she'd seen a ghost! When the owners discussed the matter with her further, & mentioned that those 'sensitive' to the paranormal likely see more than the average person, the woman in question stated categorically that she was an average person...she'd never experienced anything like this before! On the 24th of July 1932, George Albert Duncan Edwards passed away at the Ipswich General Hospital...he had been transferred to the hospital from Harrisville due to illness, leaving his wife Isabella in his stead to take care of the Royal James Hotel where he was employed as the Manager. George had lived an interesting life...having lived in Childers in Queensland with his wife, where he was employed as an accountant, at some stage around 1914-1915 George relocated to Kalgoorlie in Western Australia. At the time, the track for the Trans-Australian Railway was being laid between Kalgoorlie & Port Augusta, & George was lucky enough to land himself a role as the Superintendent of Construction, also becoming a Justice of the Peace soon after. However, by the mid 1920's George & his wife Isabella had moved back to Queensland, & had taken control of the Royal James Hotel...a venue they would manage for a few years before George passed away unexpectedly while still the Manager. Given that George's wife Isabella was left to take care of his affairs at the hotel, could George have returned to aid in divvying up his worldly belongings?? Could it possibly be his spirit that haunts the Royal Hotel, in the hope of serving one last drink before closing time?? Or, could the male entity be that of Sydney John Neaves?? Having also led an interesting life, Sydney John Neaves had spent his life working in varied roles all over Queensland. We know that in 1913, Sydney was living at the Empire Hotel in Rockhampton, whilst employed as a labourer. 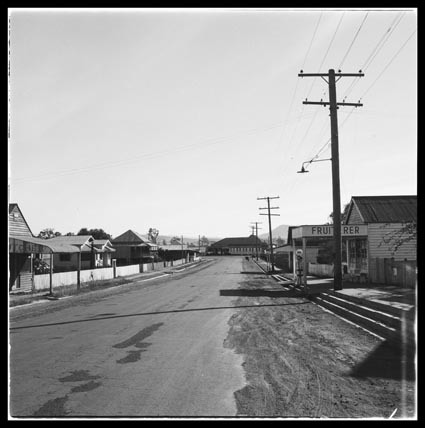 By 1919, he had relocated to Dalby outside Toowoomba, however was back in Rockhampton the next year, as he came before the Police Court there on a charge of being drunk in public. By 1925, he had again relocated, to Bundaberg this time, followed by a move to Clermont around 1930 - whilst in Clermont, we know that Sydney was employed as a sanitary worker, & took his employer to Court for unpaid wages that same year. However, by 1934, Sydney had again moved ending up in the Ipswich area. Having been in ill-health for some time, Sydney was admitted to the Ipswich Hospital for treatment, & after being discharged he headed west to Harrisville in order to either seek work or continue with a previous engagement. It is unknown whether Sydney was lodging at the Royal James Hotel or whether he had stopped in for a drink, however on the 30th of August 1934 Sydney's luck finally ran out...likely due to the poor health he'd been experiencing, Sydney's lifeless body was discovered laying on a bed in one of the Hotel's rooms, where he'd expired quietly & alone. Could Sydney's spirit be the short, stocky man who still inhabits the Hotel, seeking company from the steady stream of visitors who frequent the place? going to stay there next weekend, so will report anything exciting! That would be fantastic! Regardless of whether you experience anything, or nothing at all, we'd very much appreciate a further comment after your stay. i just started working there, i haven't noticed anything out of the ordinary, and my family has a history of (mainly the females) being able to see ghosts. i find that if i actually make an effort to look for them i find them, but lately i haven't been communicating with them. but yeah i don't know, i might say hello, i will keep you up dated. i work late nights too!